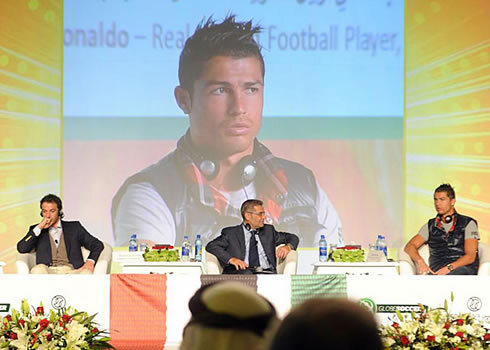 ﻿ Cristiano Ronaldo: "Spanish 'La Liga' is better than the English Premier League"
28.12.2011» Cristiano Ronaldo: "La Liga is better than the English Premier League"
Cristiano Ronaldo and Alessandro del Piero were the main attractions of this Wednesday's "Globe Soccer awards" ceremony, held in Dubai. The Portuguese player compared the Spanish League with the English Premier League and confessed that he prefers to play in Spain, since it's easier to shine for players with good technique and skills. Cristiano Ronaldo is enjoying his last days of holidays and this Wednesday he showed up at the "Dubai International Sports Conference" for the "Globe Soccer awards" gala, alongside with Juventus legend, Alessandro del Piero. The Portuguese player didn't talk much but he revealed his preference for the Spanish "La Liga", over the English Premier League. CR7 noted that it is easier for a player to show his value in Spain, since there is a higher focus given at players with greater technique and skills. 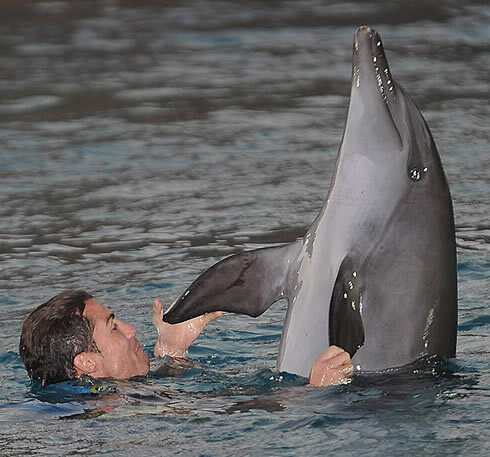 After posting a picture on Facebook this last Tuesday, on which he was playing with a dolphin at some zoomarine, Cristiano Ronaldo traveled to the Dubai, in the United Arab Emirates, to attend the "Globe Soccer awards" ceremony. Ronaldo compared the Spanish League to the English Premier League, but also insisted that he is very happy at Madrid right now, which is reason enough to discard any possibility of a sudden change to a different club, including Manchester United. Cristiano Ronaldo: "The Spanish La Liga allows every player to show his technique abilities", started by pointing out the Portuguese player when asked to chose between the Spanish League and the Barclays Premier League and just before insisting that he doesn't plan to move to a different team any time soon. Ronaldo: "I'm simply enjoying the moment. 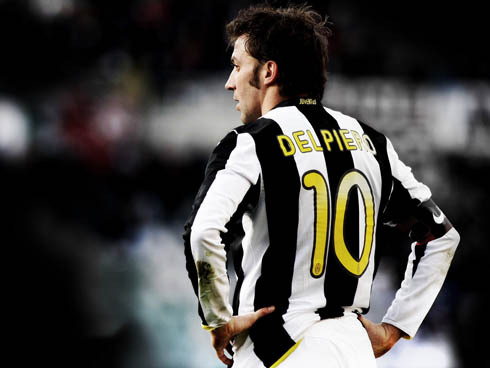 But it's true that I learned many football basics in England, specially in matters related to discipline." One of the ceremony's hosts also asked to both Del Piero and Cristiano Ronaldo if they already had an idea on when to retire from football. 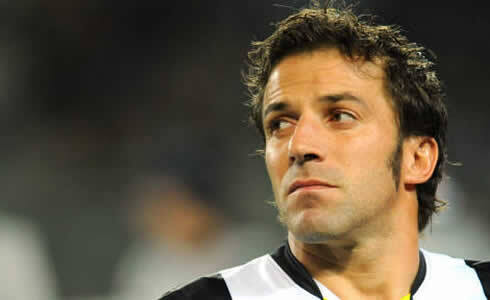 Altough the Italian player is currently 37-years old and the Portuguese star 26, Del Piero confessed that he doesn't expect to hang up the boots in a near future, while Cristiano Ronaldo is planning to play for about 6 more years. A funny moment took place short after, when one of the journalists asked Cristiano Ronaldo about his greatest fear. When the Real Madrid player was about to answer, someone from the audience shouted: "Barça!". Ronaldo ignored the Barcelona fan provocation and replied: "I don't fear anything. In this game, we have to face things in a brave way. People have to understand the reality of this sport and it shouldn't be about turning it into a war. It's a fair game and I don't fear anything in football", remarked the Portuguese player in great style. One of the biggest flaws in Cristiano Ronaldo's career so far (if it's fair to really call it a flaw), is the fact that many people are still waiting for him to shine and win a big title with the Portuguese National Team. The World Cup trophy was precisely being displayed on this Dubay conference and CR7 was also keen to stress that it's still very important for him to win big things with his country. Cristiano Ronaldo: "It's still truly important to me, but I must say that I didn't even notice the cup when I arrived here. I still have many years left to win different titles, but the most important thing is to keep winning. It's just part of my character, my culture and my life as a player", said Ronaldo when speaking to a crowded audience for the "Globe Soccer awards". Alessandro del Piero, who earlier on had said that Cristiano Ronaldo represents a new generation of stars, also left a final wish and "good luck" message to Ronaldo, regarding the possibility of his friend winning the World Cup trophy with Portugal. 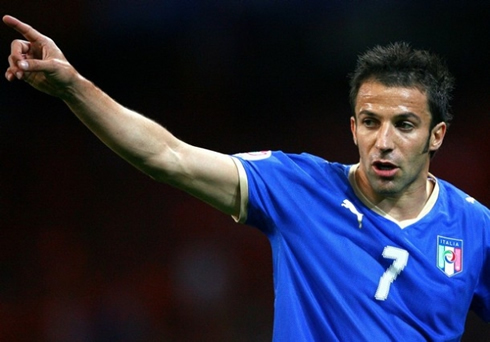 Del Piero: "I wish you the best success, including this little yellow trophy [the World Cup]", said the Juventus player and former World Champion for Italy in 2006. 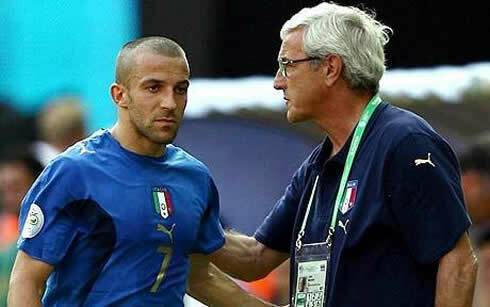 The crowd appreciated the gesture and applauded the Italian's final words on this conference. Real Madrid next match is against Malaga for the 1st leg of the Copa del Rey, in the 3rd of January 2012. The Merengues return to training this Thursday (29-12-2011). In the meanwhile, you can watch Chelsea vs Aston Villa, as well as Liverpool vs Newcastle and Manchester United vs Blackburn Rovers on Saturday, for the English Premier League. All these games are available from our football live streams section.